During the winter of 1957-58, Earl E. Bakken developed the first wearable transistorized pacemaker, the request of heart surgeon, Dr. C. Walton Lillehei. As earlier pacemakers were AC-powered, this battery-powered device liberated patients from their power-cord tethers. The wearable pacemaker was a significant step in the evolution to fully-implantable units. The plaque can be viewed in the entrance of the C. H. Best Institute, at 112 College St. in Toronto, Canada. 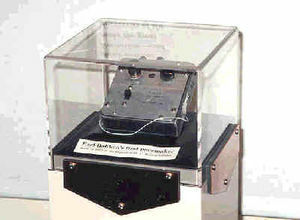 The external transistorized pacemaker was an important step in the transition from desk-top to fully-implantable units. Previous to 1957, cardiac pacemakers were bulky, vacuum-tube units operated by AC power. Patient mobility was greatly restricted, and power failures could be disastrous. Late in 1957, Dr. C. Walton Lillehei, a leading pioneer in open-heart surgery at the University of Minnesota, asked Earl E. Bakken, co-founder of Medtronic, Inc., to develop a battery-operated pacemaker. Bakken produced a prototype about 4 weeks later that Lillehei almost immediately used for treating children who had developed heart block after surgery .This wearable, transistorized unit was produced commercially as the Medtronic 5800 pacemaker and liberated hundreds of patients from their power-cord tethers, demonstrating the safety and effectiveness of long-term pacing.